Okay guys, we've got a few specific things to talk about before we move on to some more quirkiness. I've got plenty sitting here to ramble and laugh about, but I want to get the serious stuff outta the way to begin with. 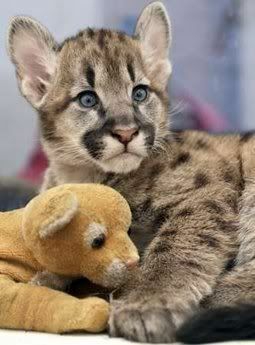 Two-month-old North American Puma cub Baron plays with a plush tiger in a zoo in the Siberian city of Krasnoyarsk November 24, 2006. Baron was beastfed by a dog because its mother refused to feed it. Now I rarely talk about my personal life, but this reminded me enough of my mother to actually call her at work on my way out the door to head to my own job. She recently took temporary (and likely permanent) custody of her sister's 3 little ones (8, 5, 4) for various reasons that really aren't relevant to discuss. It was just that fleeting thought that a dog cared for a puma because its own mother refused to....and that's how my mom is. She was in no way obligated to take those girls....they weren't her own.....but it means the world to them, just like it meant the world (not to mention 'life') to that puma. As I've been following new blogs, I've run across numerous 'mommy blogs', and a good portion of them are from either adoptive parents or foster parents. This is my mini-tribute to all those loving parents who took in their very own pumas and gave them the opportunities of life that they wouldn't have otherwise had. Thank you.